The poster for "Valerian and the City of a Thousand Planets" (2017) was revealed Oct. 6, 2016 at New York Comic Con. NEW YORK — "Valerian and the City of a Thousand Planets," a big-budget action movie built from a long-running French comic, has arrived at New York Comic Con. Its booth here at the Javits Convention Center mashes up the old and the new, featuring an old-school comic shop alongside computer-generated imagery (CGI) of a spaceship for visitors to explore and an eye-catching display of the film's poster. 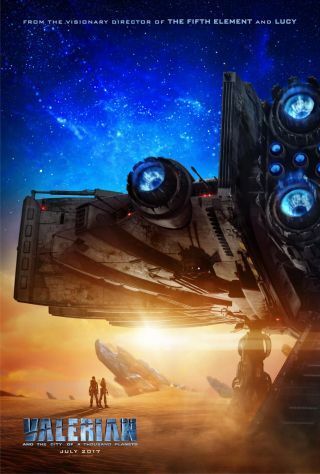 "Valerian," which will be released in July 2017, follows two special government agents as they try to unravel the evil putting the mega-sprawling space-station city Alpha in danger. The movie's director, Luc Besson, also directed "The Fifth Element" — and he's loved the story ever since he read the comic as a 10-year-old, according to promotional materials for the film. "I wanted to make this film years ago, but I had to wait for the technology to catch up with my imagination," Besson said, as quoted in the pamphlet. Outside the booth was a massive poster, first released yesterday morning (Oct. 6) on the first day of the convention. Rendered with a 3D holographic effect, the poster was draped with material so nobody would see it until its big reveal that morning, employees at the booth told Space.com. A series of colorful posters greeted visitors to the "Valerian" booth at New York Comic Con. Upon entering the booth, visitors walk past abstract, colorful prints featuring the movie's two heroes, Valerian (played by Dane DeHaan) and Laureline (played by Cara Delevingne). Clive Owen, Kris Wu, Ethan Hawke, John Goodman and Rihanna are also featured in the movie. Visitors pass a screen showing short clips, as well as a trio of life-size aliens from the series, called the Doghan Daguis, who share a collective brain with vast knowledge of the universe. Next, Con-goers arrive at a green-screen ramp, where they can pose for a virtually rendered photo. They're placed on the ramp of the characters' spaceship, the Intruder, showing a weathered, industrial-looking hull touched down on a desert surface. In the movie, the Intruder lets the main characters travel through time and space. "Valerian" director Luc Besson and the comic's co-creator Jean-Claude Mézières met fans to sign the film's newly-released poster at New York Comic Con on Thursday, Oct. 6. Just next door, sharing a wall with the CGI set, is an old-fashioned comic-shop setup, cluttered with original copies of the comic and other bric-a-brac. On Thursday, Besson and Jean-Claude Mézières, who co-created and illustrated the original comic, signed movie posters for fans. Mézières worked with Besson on "The Fifth Element," and used to ask why he hadn't made a "Valerian" movie, too. Besson said he didn't think the special-effects world was up to it — until James Cameron's "Avatar" was released in 2009. The booth will stand for all four days of the convention, showing what seems to be the movie's aesthetic — a comic-book sense of adventure and modern special effects to define a sweeping sci-fi world. Space.com's Sarah Lewin posed with the Intruder at New York Comic Con Thursday — the ship can carry Valerian and Laureline through space, but seems to have taken her to a desert of some kind.